Tax Day in 2018 in North Carolina presents an opportunity to make sure our tax code allows us to meet our goal that every community and family can thrive. Here are FIVE FAST FACTS to keep in mind this tax season. Fact #1: Taxes make North Carolina thrive. What are the foundations of a thriving community? Schools that have the textbooks, teachers and supportive personnel to ensure every child can learn. Communities that have safe drinking water, public parks and revitalized main streets. Families that can put food on the table, live in affordable and safe housing and access preventive health care. This foundation is built with taxpayer dollars—contributions that we all make to ensure that every community can connect its residents to opportunity regardless of their own economic challenges. The research is clear : Public investments can generate important returns for individuals and the broader economy by increasing educational attainment and strengthening the knowledge economy, by building the networks and infrastructure that support community development, and by reducing high costs down the line through investment in young people’s healthy development, supporting workforce development and protecting families from hardship. From the Budget & Tax Center archives, check out these summaries of the literature here and here and here and here. 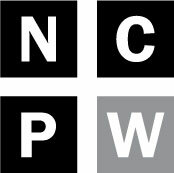 Here is a series on how to build an Economy for All from the North Carolina Justice Center. From the Center on Budget & Policy Priorities, check out this fiscal policy blueprint to grow the economy. Fact #2: Everyone pays taxes. 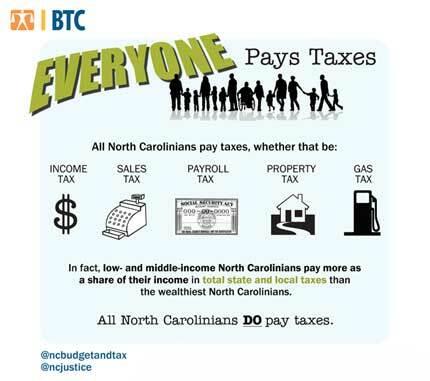 In North Carolina, as is true across the country, everyone pays taxes. While some advocates focus just on federal income taxes paid, it is important to remember that taxes are paid not just through income taxes, but through sales and property taxes, as well as taxes on gasoline and other specific items. From the Brookings Institution on federal taxes paid. From the Center on Budget & Policy Priorities regarding misconceptions and realities about who pays taxes. From the Institute on Taxation and Economic Policy regarding state and local taxes paid. Fact #3: North Carolina asks the poor to carry a heavier tax loads than its millionaires. Taxpayers with the lowest income also pay a greater share of their income in state and local taxes than do the wealthiest taxpayers in the state. In fact, taxpayers living in poverty pay nearly twice as much than millionaires do in state and local taxes as a share of their annual income. Since 2013, more than two-thirds of tax cuts have gone to the wealthiest one percent of taxpayers in North Carolina. The federal tax plan passed in 2017 will further consolidate the gains for wealthy taxpayers and shareholders of corporations, including foreign investors. From the Budget & Tax Center archives, see our summary of the latest tax changes at the state level and at the federal level. From the Institute on Taxation and Economic Policy about who pays state and local taxes. Fact #4: Corporations are getting a big tax cut, even though they are unlikely to boost the local economy as a result. In North Carolina, the share of state and local taxes paid by businesses is the lowest in the nation. Before the tax cuts, an Ernst and Young and Council on Taxation study found that the state and local taxes businesses paid in North Carolina represented 3.6 percent of the Gross State Product. The national average was 4.9 percent. Since 2013, the rate of taxation for corporate profits has been cut more than in half, dropping to 3 percent from 6.9 percent. North Carolina now has the lowest corporate income tax rate among states that tax corporate profits, and that rate will decline again in January 2019. From the Budget & Tax Center archives check out these analyses of corporate tax cut proposals here, here and here. Fact #5: North Carolina’s tax-cut experiment has failed. North Carolina’s tax cut experiment has not delivered on its promise of jobs or greater economic well-being. Instead, North Carolina continues to experience persistently high poverty rates, and the median worker is still not earning what they were before the Great Recession started, given the rising costs for goods and services. While North Carolina is creating some jobs, we aren’t out-performing our neighbors and are not keeping up with the growth in our population, which means our employment levels remain below where they were before the recession started. From the Budget & Tax Center archives check out this analysis of the past ten years of economic trends in North Carolina, this regional comparison, and a number of Prosperity Watch reports on North Carolina’s persistent economic challenges. From the Center on Budget & Policy Priorities, check out this blog series on the cautionary tale of North Carolina’s experiment with tax cuts.